While speaking to the Store Horsemen podcast, Enzo Amore revealed what the plan was for the abandoned romantic storyline between himself and Nia Jax. 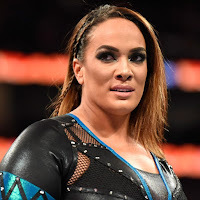 Apparently, there was going to be some treachery eventually which would have resulted in Nia Jax discovering her best friend was hooking up with her man. "I was getting so much heat it was awesome that people probably won't appreciate it until five, ten years from now," Amore said. "Like a babyface transition that I made and on a marketing level too it was crazy and Vince wanted me in that grey area though. He didn't want me full-blown. He had plans to make me full-blown that nobody else knew about, not even the other people that were involved in it." "I mean look at that Nia / Alexa Bliss WrestleMania blow-off. What do you think was gonna happen? How else could I get full-blown heat? Enzo Amore with the grey area trying to get full-blown heel real, real f--king heat. How do you do that? I'm using Nia as a heater to keep my title and I get caught hooking up with her best friend backstage. Bang, that's how you do it. Nia didn't know that. Alexa didn't know it. I knew that because Vince told me [...] I was just toying along with her I wanted her to win me matches, I wanted her to be like Chyna."